With so many beautiful landmarks and an amazing skyline, one of the best ways to see New York is through New York City Panoramas. Encompass much of the city and its luster all at once with these fabulous New York City Panoramas. 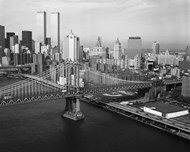 From busy Times Square to memorable images of the Twin Towers, there is a New York City Panorama image for everyone and every decor.